During the week of April 23, the International School of Beijing (ISB) honored Earth Day by performing activities guided by a theme of Actions with Purpose. In the classroom, ISB teachers are hard at work connecting students with global issues such as climate change, sustainable agriculture, and human rights. Actions with Purpose is about expanding on those lessons by providing students with real-world examples of these issues in play and how their individual choices can make an impact – empowering students with global-mindedness. No Beef Lunch by Chartwells: Did you know that beef requires 28 times more land and 11 times more water on average than all other meat types? Switching even one meal from beef to another meat once a week can make a big difference, meaning you do not have to be a vegetarian to have a positive impact on the world! Low Litter Lunch hosted by the Roots & Shoots student group: Did you know one the largest sources of waste in our cafeteria is from takeout containers? Students from the Roots & Shoots group are keenly aware of this and took the issue head on by providing students with free food in return for forgoing takeout this one day. Free Earth Day Ice Cream provided by the PTA and ISB Green Team: Did you know that the production of palm oil, a key ingredient in ice cream along with thousands of other food and beauty products, is causing widespread clear cutting of tropical rainforests in Indonesia? Poor agricultural practices with palm oil have placed numerous plants and animals on the endangered list. However, some companies have banded together to promote sustainable agricultural methods by purchasing Certified Sustainable Palm Oil (CSPO). As customers, we can make the same choice to stop the clear cutting and save the world's animals by buying from companies that use 100 percent CSPO, such as Unilever. On Monday, anyone wearing blue, brown, or green was provided free Unilever brand ice cream. To learn more about what companies are using CSPO, click here. For Tuesday and Wednesday, we switched our focus to a trending issue here at ISB, in China and around the globe – food waste. Globally, researchers estimate around a third of all food produced is thrown out. A partnership between the Net Impact ISB student group and the Environmental Science and Systems Grade 11 class decided to put food waste at ISB on the scale. 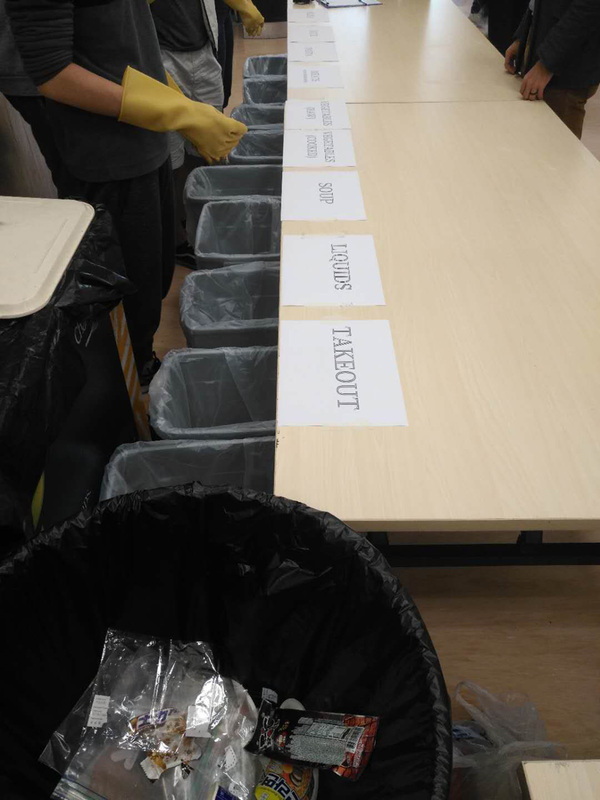 Over two days, all waste generated during the High School (as well as Middle School on the second day) lunch was collected, separated and weighed by the students to understand how much of each type of food (rice, vegetables, takeout etc) we toss in the garbage. Further, not only did they want to know how much, but why students and staff were not finishing their lunch. Interviews were conducted on the spot to get to the root cause – no answers of "I didn't like it" were accepted; they wanted to know was it cold, too salty, served in too great a quantity etc. The next step will be to analyze all this data to determine if and where improvements can be made to reduce our impact. To close the week out, ISB Wellco hosted a lunchtime discussion for staff to elevate awareness around waste management at ISB and in Beijing. We hope these activities sparked a positive discussion or two and that students were able to connect how their individual choices can make an impact across the globe! Our commitment to sustainability will be further shown next week with Net Impact Bike Week, which is being coordinated by two grade 10 students. Hannah G and Christy E had the idea at the start of the year for an event to promote a low-impact means of getting to school. They reached out to Trek Bikes, which will be providing cycling education and tire checks on two of the days. The two students are also finalizing a map of safe routes to school as well as signing up bike leaders to guide groups of staff/students from gathering points to the campus.